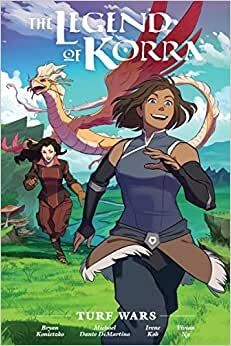 Written by series co-creator Michael Dante DiMartino and drawn by Irene Koh (Secret Origins- Batgirl, Afrina and the Glass Coffin) and with consultation by Bryan Konietzko, this is the official continuation of The Legend of Korra! Love Avatar. However with this edition the book isn't as wide as the previous. which gives full page graphics but with the downside of no room for commentary. So now there is no difference between the library edition and the individual novels when it comes to information. I hope this is not a trend that will continue. Because then there is no reason to buy the library edition. (I collect everything cannon to the shows and no more) I don't want this to be how they make the library edition from now on. But if it is I hope it will only be with the Korra novels. And not the last airbender when imbalance comes out. So there is at least some consistency. I have bought the library editions for every other Avatar story, and will most likely continue to do so, but this is the first one that has disappointed me. First off they have a new artist, possibly to separate the Korra novels from the Aang ones, and sadly the art does not look as good. While i recognize the characters being portrayed, some of their depictions are quite jarring and look nothing like how i would imagined them. The other novels always did a good job of having the art be very similar to what we saw in the shows. My biggest complaint though is the lack of commentary on the sides of the pages. This was, in my opinion, the best reason to get the library edition. Hearing the reasoning for why they drew something a certain way, or why a character is acting as they are was amazing insight into the creation of these stories. While the library edition for Turf Wars still has the sketches at the end, missing the commentary is in my opinion a huge mistake that i hope they rectify before the next book comes out. 2.0 out of 5 starsMeh. Not as good as other Avatar stories. Compare to other Avatar library editions, this one is clearly not at the same level. The art style seems like draft instead of finished drawings. Often times, the characters don't even look like themselves. The story is also uninteresting compare to others. The threat is hardly Avatar worthy. Commentaries are missing as well. Although not a big deal for me, they were nice additions for other Avatar collections. Had it not been a Legend of Korra book, I would not keep it in my collection. I enjoyed the commentary from the writers and artists of the previous library editions. It was without a doubt a mistake to not include them here. The rest is all just as good, but if you enjoy the commentary, you're going to be dissapointed.